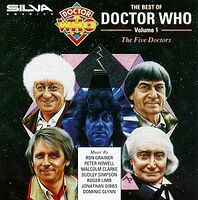 Note: Not to be confused with the 1992 UK CD which used a similar title and artwork, this US compilation features a mix of tracks previously released on Doctor Who: The Music and Doctor Who: The Music II, plus the "Terror Version" of the Doctor Who theme, from Variations on a Theme. Followed by The Best of Doctor Who Volume 2: The Greatest Show in the Galaxy. (a) Banqueting Music from "Warrior's Gate"
(b) TSS Machine Attacked from "Kinda"
(c) Janissary Band from "Snakedance"